Even from the air Malawi is a lush country, especially now in the rainy season, when it thickens with growth, undergrowth, and mirages of plenty. As far as I can see, small fields laid out like patchwork cover the land. Trees grow densely, in every shade of green – cassava, pumpkin, banana, baobab. I think of the children I would meet tomorrow, all refugees, and the endless questions they would cast at me, desperate challenges for which I would have no answer. The modest would ask for more food, medecine, pencils. The bold would want visas for the developed world. The frantic, a passage for “anywhere outside this accursed continent”. I could only offer them messages to a faraway relative, leading, perhaps, to a reunion, perhaps – miracles do happen – in Paris, London or Montreal. The next day I drive to a small refugee camp called Dzaleka with Anthony, an NGO official. He is easy-going, sings as he drives, and recounts stories of his grandfather, the witch doctor, who would fly from Nyasaland to South Africa in a minute. 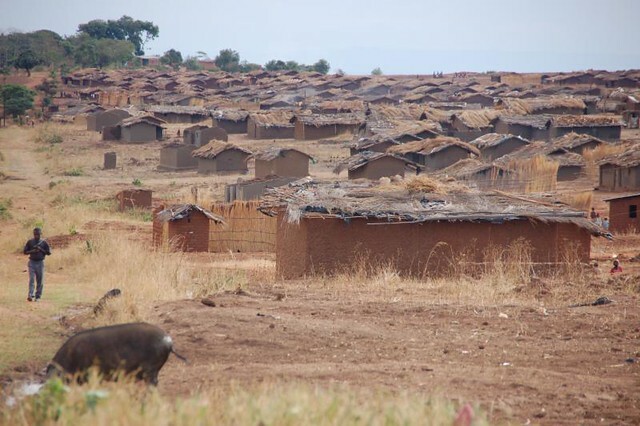 Like all of Malawi in this season, the camp is half hidden by solid stalks of maize and banana groves that hide the concrete administrative buildings and mud houses. Have I come to a garden, where I expected a refugee camp? But here is the Malawian administrator in his bare dusty office. Here are the UNHCR posters on the cracked wall – so they do visit here from time to time! – and the Red Cross table calendar on a plywood desk overflowing with yellow papers. Dzaleka is considered a small, back-water, forgotten camp, for most refugees a way-station or a hiding place. The camp population has grown steadily to accommodate the flow of Congolese refugees. The administrator says that the Congolese are the first to go back. “As soon as there is a lull in the fighting, they rush back, unless they have personal reasons not to, or they are waiting for resettlement abroad. We have great trouble persuading them to stay while danger persists. The Congolese are crazy. They are not allowed to work here, but they still do business. Some have come with bicycles and cycle to Blantyre every week to sell goods!” There are older refugees in Dzaleka, too Rwandans, Burundians, even Somalis, each with their own desolate memories. Anthony tells me that in the old days, under the dictator Dr Hastings Banda, Dzaleka had another name and was used as a political labour camp. 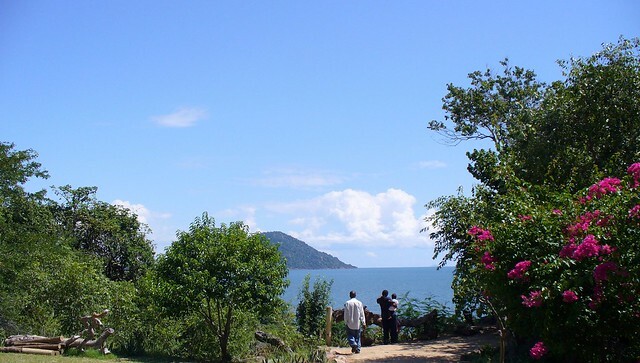 It was a place so notorious that those people who emerged alive used to swear, upon leaving, “dzaleka!”, which means, “never again!” in Chichewa. Now the camp hosts people who have fled other horrors and have in turn sighed, or screamed, “never again!” in Lingala, Kiswahili, Kinyarwanda, Kirundi. I spend the day speaking to children and young men. We sit together in a small school room. No class today, it seems: they have morning or afternoon school twice a week. French and English pratice sentences decorate the classroom. “La porte est fermée. The door is closed”, “The bird is flying. L’oiseau vole”, with drawings of a blue door, a sparrowhawk soaring. The benches creak under the weight of so many people. The arrival of a Red Cross musungu kazi, white woman, is news that has spread throughout the camp as fast as Anthony’s grandfather. I haven’t been in a schoolroom for 15 years. I crunch myself on on one of the tiny desks – they didn’t used to be so small, did they? Anthony sits at the back. He does not understand the conversations in French, but smiles gently, unperturbed by the waves of passion that overtake the classroom periodically. Only once does he intervene, when a row erupts between several boys vying for attention. I don’t know if they understand his scolding Chichewa, but his tone calms them. Men and boys have gathered around me, with only three girls amongst them. I am told the other girls and the women are cooking and working their small vegetable patches. I ask the assembled refugees a few questions to which many answers fuse all at once. What energy is there! The energy of survival, of anger, but also a life-force that not even war has dimmed. “Il ne fait pas bon être nègre” , Papy says, a thin twenty-five year old, who still bears signs of Congolese panache – la Sape – in his swagger and his well-kept purple jacket, a size too large for him. “How can you say this? how can call yourself that? ” I ask, the brutal colonial word screeching against my nice liberal mind. He is deliberately baiting me now, using that word as a weapon, daring me to resist him, to place my reason in the way of his anger. I search for words, and see myself, instead. My clothes are new, I ate breakfast this morning, I use a reasonable voice which keeps a proper distance between the refugees and me, the way I was taught when I took this job. Then as fast as the storm erupts, it shifts, whirling me along: “How do I get some books? We are setting up adult classes with some refugees that are teachers – we have no paper, but we can always write in the dirt, Africa has plenty of that.” “I want to join my brother in Spain, my uncle in Brussels. I want to go back to Goma, to Kisangani” (How did someone from Kisangani land here? I wonder). “I want to find my wife before I forget what she looks like.” In another change of tone, they cajole me: “Are you married? how old are you? Will you ever marry? But not a refugee. We know that! None of us have anything to offer you.” They are daring me again. I talk, I laugh, I battle with them for what I will and won’t do – “just give us the means and we’ll do it for ourselves”. These are not the aid degenerates dear to the armchair critics, nor are they victimised losers. These are gifted, truculent young men who would be an asset to any country, in bright curiosity, in bravado, in impudent sexiness, now intense and rimmed with sadness, because it’s practically all they have left. Perhaps it’s true that hardship concentrates the mind, sharpens the talents. In European and African towns, Congolese refugees prosper in many ways. Some become law professors, writers or musicians. Some sell Prada bags – fake and genuine, as long as it has a label – or set up smart scams. None sit down and weep about their fate for longer than a Koffi Olomide love song. And the children? After all, I came for them. There are still many Rwandan children, left over from the great flight of ‘96, when the refugee camps in Zaïre and Tanzania were dispersed by the Rwandan Pariotic Army (RPA). A few refugees ended up here, in Dzaleka, after thousands of miles of walking, from forest to forest, bush to bush, camp to camp. Dzaleka is just a stage on an endless journey. Some still limp. I can hardly imagine what they must have seen, the memories they heave silently about like bundles on their heads. Many of the other children and teenagers are traumatised. Congolese war, Burundian war, Somali war, all have left scars. Jean-Pierre from Bukavu in Eastern Congo can barely see, he closes his eyes downwards and refuses to look at the world. I learn that two months ago, he saw his family sliced up by the rebels, because his father wrote a letter of support for the government in Kinshasa. He was outside the house when they came, and hid in the hen coop. Calliste, a thin young Burundian, streams sweat and shakes like a blade of grass. His mother is Tutsi, he says, and his father Hutu, and both communities want his blood, even here in Dzaleka. Some should be traumatised and are not, another mystery. There is a calm, slightly worried-looking seventeen year-old Congolese boy who has been father and mother to his four little brothers and sisters since the age of fifteen. Two years ago, their parents were killed by the Mayi-Mayi, naked hunter-warriors who started off as resistance fighters and ended up perpetrating massacres, like most participants in that dirty war. He and his siblings fled their home town, Uvira by Lake Tanganyika, returning after three months. As they grew older, the Mayi-Mayi renewed their threats. One day, six weeks ago, he came home and found the death-sign of the Mayi-Mayi daubed on the front door. He picked up the children and ran, this time from the country. “I am worried, because I have no money for the little ones. My elder brother is in Canada and could help care for us. We can’t go back, the Mayi-Mayi want to wipe out our family”. There’s a story in that, but I’ll never know it. His eyes give nothing away but immediate concern for the future. All he wants is help in getting organised. He writes a Red Cross message for his brother in Canada, gives me the latter’s email address and takes down the address for the nearest Canadian High Commission. Some of the Congolese laugh around him, one boy drums on his desk, one gets up to dance the ndombolo. The Rwandans and Burundians look on, immobile. Anthony and I drive back to Lilongwe exchanging impressions. Some we can help, others not. Some will find their own way, some will compromise their dreams, some will give up. Many will refuse to give up, and shout out “never again!” Dzaleka. I am angry at the neglect, the waste. The North expresses guilt about the oppression of Africa: but what is killing Africa now is not only oppression and exploitation, it is indifference. L’abandon. That’s what they call it. When I left the camp, not one person forgot to wish me a merry Christmas and happy holidays. A year later, sitting in an office in Kinshasa, I received a letter from the young man who looked after his four brothers and sisters. They had reached Canada. For reasons of discretion, names have been changed.